On Tuesday night, Russell Westbrook had to get out his Dad Hat in the middle of a game and lecture a kid and his father about appropriate and respectful fan behavior. And he had a good reason. During the third quarter of the Oklahoma City Thunder’s 121-112 loss to the Denver Nuggets, the kid (presumably a Nuggets fan) tapped or lightly pushed Westbrook just after the ref blew the whistle. Westbrook turned around and stared the kid down for a few seconds before going over to talk to him and his dad. Westbrook kept his cool and didn’t get angry, because the issue isn’t that the kid injured him. The issue is that the kid felt like he could just touch a player during a game. 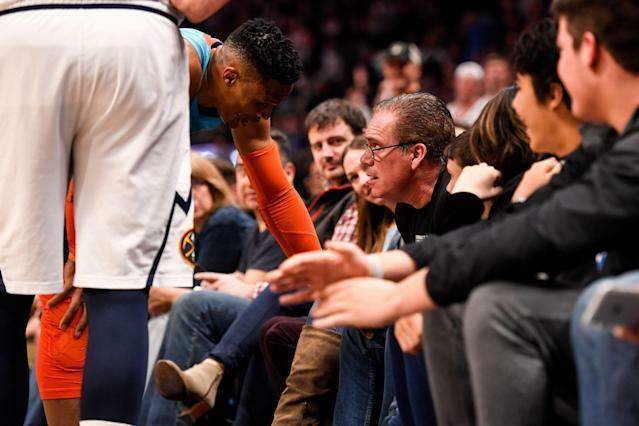 After the game, Westbrook talked to the media about the incident, and revealed what he said to the young fan and his dad during their interaction. Basketball lends itself to this kind of player-fan interaction more than any other pro sport simply due to the design of the court and the stands. In baseball, football, and hockey, there’s a defined barrier between fans and the field of play. In basketball, fans have nothing between them and the players, and fans in the best seats (like the kid and his dad had) are essentially courtside. With the ability to get close to the players (close enough to actually touch them), what Westbrook is asking for isn’t nuts. He doesn’t think that fans should be allowed to touch him or any other player during a game, which is just common sense. Imagine a fan walking up to a player and giving him a light shove during a football or baseball game. That would never be allowed, so why should basketball be any different?